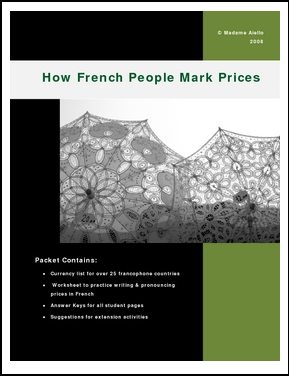 This is a series of brief worksheets related to money and prices in French-speaking places. the first identifies the differences between how prices are written in English and in French (using the dollar as the currency unit). The second identifies the currency of about 25 countries where French is a national language. There are two versions of this worksheet so you can select the level right for your students, as well as which information you would like them to research. The third engages some critical thinking skills as students calculate what the price of certain souvenirs in francophone countries would be in American dollars, and then discuss alternatives in terms of their preferences in spending a limited amount of money. It can be used as a follow up activity to any reading selection containing prices, or other activity in French where prices are encountered. Alternatively you could lead a short discussion beforehand about how much things cost, writing the prices on a whiteboard or chart paper. These activities are also good for practicing numbers (mostly 0-1000) as well. It could also be used as a lead in to higher level discussions on topics such as cultural differences and varying standards of living around the world.